Abstract: The impacts of climate change are beginning to be felt around the world. Case studies that identify the immediate causes of disasters as well as their root drivers provide the empirical basis for strategies to increase resilience to climate impacts. Here we present a case study of the city of Cagayan de Oro, Mindanao in the Philippines and its experience with Tropical Storm Sendong (international name Washi) in 2011. We use local key informant interviews from 2014 and secondary sources to identify both the local, immediate causes as well as the more widespread root drivers of the disaster. We focus on two root drivers in particular: informal settlements in hazardous areas and political dynamics based on patronage, which can present risks both pre- and post-disaster. Addressing these root drivers will be important for increasing climate resilience in the Philippines and other countries. 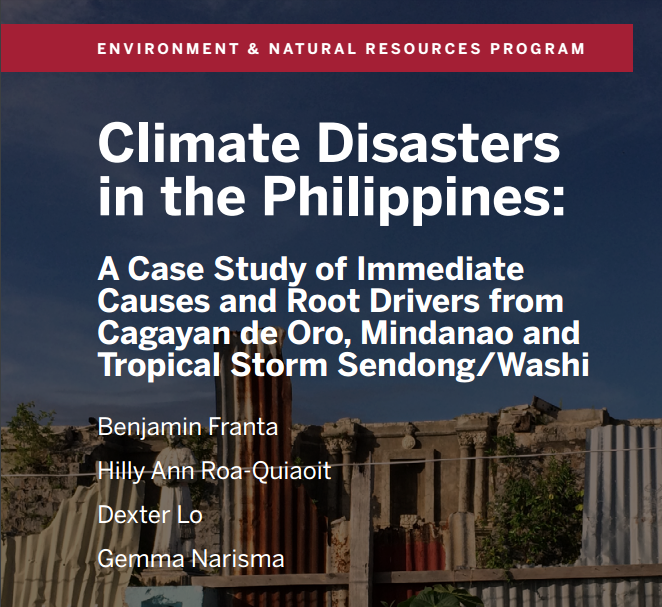 PDF: Climate Disasters in the Philippines: A Case Study of the Immediate Causes and Root Drivers from Cagayan Mindoro, Mindanao and Tropical Storm Sendong/Washi. Published by Belfer Center for Science and International Affairs, Harvard Kennedy School. Benjamin Franta is a PhD student in History of Science at Stanford University. The research for this report was primarily conducted while the author was a Research Fellow at the Science, Technology, and Public Policy Program at the Belfer Center for Science and International Affairs at the Harvard Kennedy School. Hilly Ann Roa-Quiaoit is the Vice President for Research and Social Outreach at Xavier University Cagayan de Oro, Northern Mindanao, Philippines. Dexter Lo is the founding director for the Xavier University Engineering Resource Center, Cagayan de Oro, Northern Mindanao, Philippines. Ateneo de Manila University Campus and Physics Department, Ateneo de Manila University, Quezon City, Philippines.